Baton Rouge, La. – September is Emergency Preparedness month. 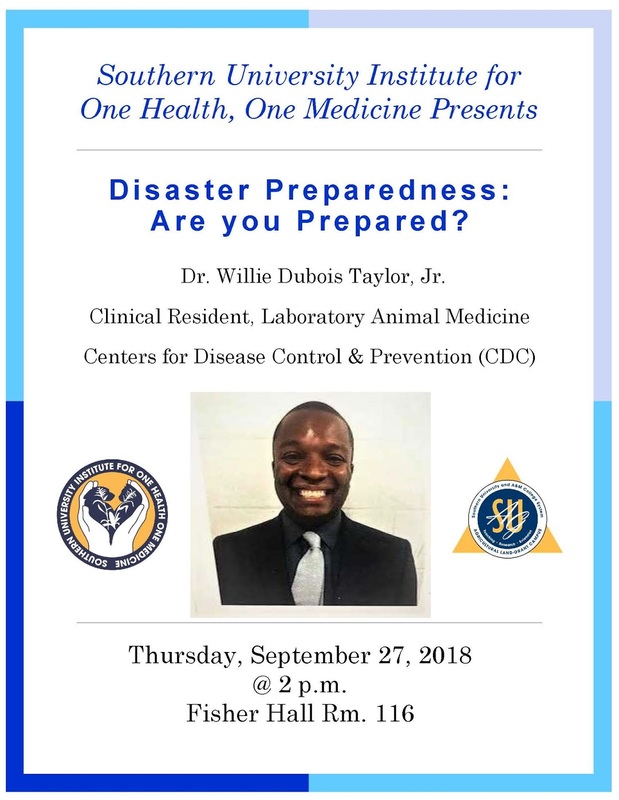 In an effort to ensure that the Southern University community and the residents of Baton Rouge are adequately prepared for the next disaster, the Southern Institute for One Health, One Medicine will host an emergency preparedness seminar at 2 p.m. on Sept. 27 in room 116 of Fisher Hall. The seminar will be led by Dr. Willie Dubois Taylor, Jr., Clinical Resident of Laboratory Animal Medicine at the Centers for Disease Center and Prevention (CDC). 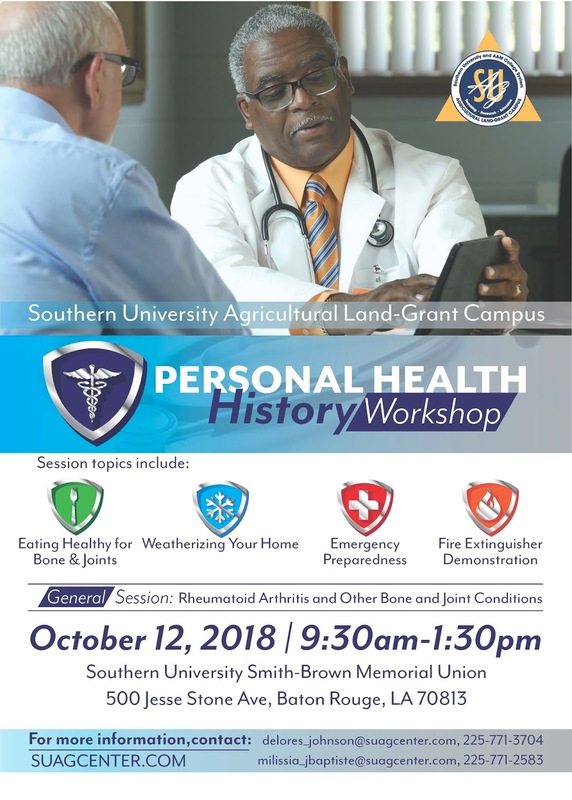 The Southern University Institute for One Health, One Medicine was developed to conduct biomedical and agricultural research to improve the lives of both humans and animals. The Institute advocates for research that benefits animal and human health and well-being and believes that we are uniquely qualified to lead research efforts to that purpose. For additional information about the Southern University Institute for One Health, One Medicine, visit http://www.suagcenter.com/page/southern-institute-for-one-health-one-medicine-siohom. Smith-Brown Memorial Student Union, 500 Jesse Stone Ave., in Baton Rouge on Southern University’s campus. Baton Rouge, La. 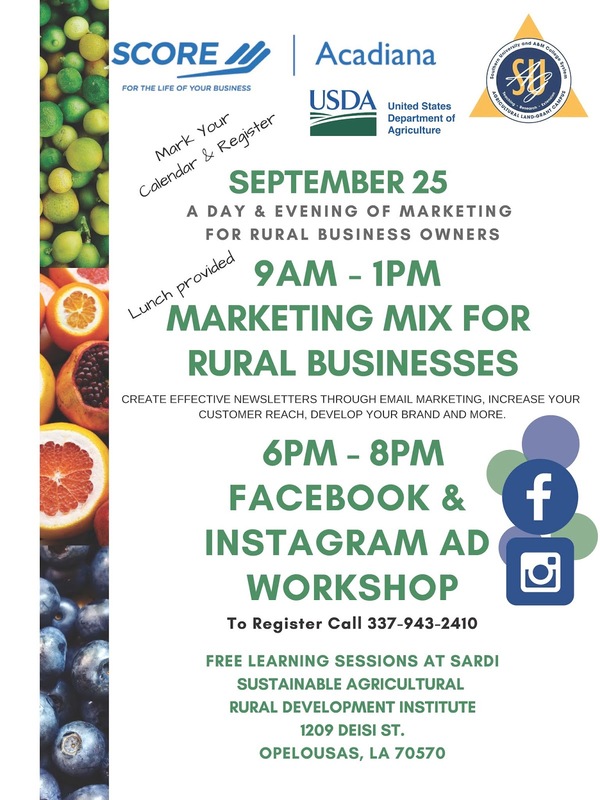 – The Sustainable Agricultural Rural Development Institute (SARDI) has partnered with the USDA and the Acadiana chapter of SCORE to host two events for rural business owners in the Acadiana area. The free learning sessions will be held on September 25 at SARDI’s office, located at 1209 Deisi St., in Opelousas, La. Activities will begin at 9 a.m. with a ‘Marketing Mix for Rural Businesses,” followed by a ‘Facebook and Instagram Ad Workshop’ at 6 p.m. The sessions will be led by Tonia Askins, Louisiana District Director of SCORE Louisiana, and will teach business owners how to create effective newsletters through email marketing, increase their customer reach, and develop their brand. Both events are free and open to rural business owners, but registration is required. To register, contact SARDI at, 337-943-2410. The Acadiana SCORE chapter is a non-profit association dedicated to educating entrepreneurs and helping small businesses start, grow and succeed by providing guidance and counseling in the eight parish area of Lafayette, St. Martin, St. Mary, Vermilion, St. Landry, Acadia, Evangeline and Iberia. SARDI is a satellite campus of the Southern University Ag Center housed in Opelousas, La. The Institute focuses on improving the socioeconomic well-being of citizens in rural communities within a ten-parish region of St. Landry, Acadia, Allen, Avoyelles, Beauregard, Evangeline, Lafayette, Pointe Coupee, St. Martin and Vermillion. Baton Rouge, La. 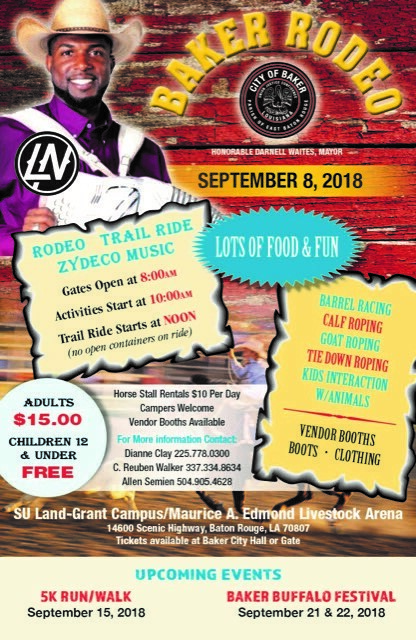 – The Southern University Land-Grant Campus has partnered with the City of Baker to host the Buffalo Festival Rodeo. 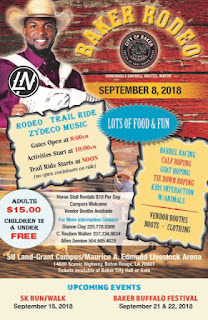 The event will be held on September 8 at the Maurice A. Edmond Livestock Arena. Tickets are $15 for a full day of activities. Gates will open at 8 a.m. with youth and adult rodeo activities beginning at 10 a.m. and a trail ride at noon. The event will end with a zydeco dance featuring Lil’ Nathan and the Zydeco Big Timers. This event is one of several sponsored by the City of Baker in celebration of Buffalo Festival Month. Tickets can be purchased from the Baker City Hall or at the gate on the day of the event. 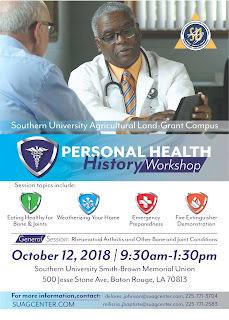 The Southern University Ag Center and the SU College of Agricultural, Family and Consumer Sciences together are called the Southern University Land-Grant Campus. Baton Rouge, La. 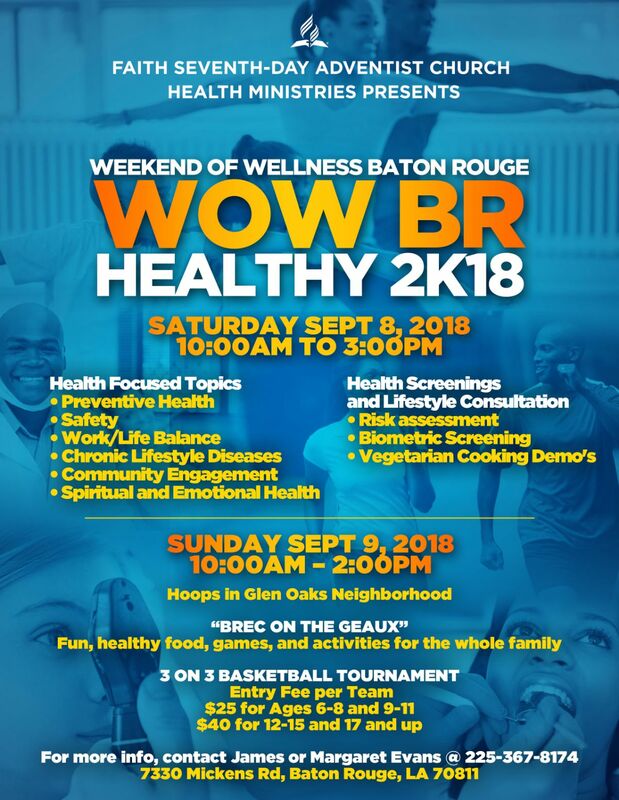 – Members of the Southern University Land-Grant Campus will participate in the Faith Seventh Day Adventist (SDA) Church’s Weekend of Wellness Baton Rouge (WOW BR) Expo. The event will be held at the church’s location, 7330 Mickens Rd. in Baton Rouge. 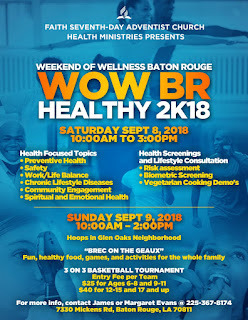 This marks the second year that the church’s Health and Wellness Ministry Department has sponsored the event, which will feature the Healthy 2k18 Wellness Expo on September 8 from 10 a.m. -3 p.m. and ‘Hoops in the Glenn Oaks Neighborhood’ on September 9 from 10 a.m. – 2 p.m.
Communities of Color Network Regional Coordinator Frankie Poland and SU Ag Center Extension Associate for Community and School Gardens, Stephanie Elwood will make presentations on September 8. The two program areas, along with the Family and Human Development Unit will also have booths to provide participants with additional information about their respective programs. The goal of the event is to highlight the importance and benefits of healthy lifestyles through health education, interactive games, activities, live cooking demonstrations, and entertainment. For additional information about WOW BR, contact James or Margaret Evans at 225-367-8174.